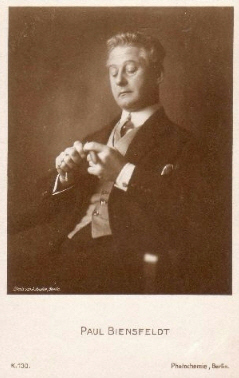 The actor Paul Biensfeldt was a popular actor who was gladly engaged by well-known directors. For Fritz Lang he played in four movies - "Die Spinnen" (19), "Harakiri" (19), "Der müde Tod" (21) and "Dr. Mabuse der Spieler" (22). Beside it he appeared in the movie classics "Madame Dubarry" (19), "Veritas Vincit" (19), "Sumurun" (20), "Anna Boleyn" (20), "Das Weib des Pharao" (22) and "Dagfin" (26). The sound film offered Paul Biensfeldt some interesting roles too, among them "Hokuspokus" (30), "Das Flötenkonzert von Sanssouci" (30) and "Der weisse Dämon/Rauschgift" (32). Just recently they discovered a copie of the presumed missing movie "Die ideale Gattin" (13) - an early Ernst Lubitsch movie in which Paul Biensfeldt played the leading role. Let's hope that in future there will emerge more movies which are long forgotten in order to enrich the film world with such early relicts of the past.